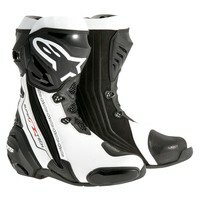 Alpinestars most iconic riding boot, worn by a roster of champions past and present, the Supertech R has undergone a series of evolutions to significantly ramp up its performance features even further. Innovations include a newly redesigned compound rubber sole, an update to the ergonomically profiled shinplate and a redesigned front flex area – all of which enhancing the podium winning performance of this CE certified boot. Microfiber main shell offers high levels of water-resistance, durability, and improved weight-savings. Material ensures consistent fit for long term usage and is easy to maintain and clean. Redesigned front flex area is constructed from over-injected TPU over inject on breathable mesh with shaped reliefs for improve abrasion resistance and natural forward and back movements. Top gaiter follows leg contour and is made of flexible high-grade synthetic leather reinforced with PU. Lightweight rubber compound sole offers excellent grip and feel and allows for natural flex as the rider changes position and pressure on the foot-peg. Newly designed external TPU shin protection is ergonomically shaped and wraps around to outer calf and is engineered to spread and dissipate impact energy across the entire surface while remaining compact. Integrated replaceable co-injected TPU/Aluminium toe slider features new easy screw fixing concept provides feel and protects the outer toe box structure from abrasion. Replaceable polymer heel plate slider protects from impact and reduces friction in the event of a crash. Innovative, full length medial-facing microfiber panel features new texture pattern offering excellent grip and feel against the bike and protects from abrasion and heat. Separate internal bio-mechanical ankle brace works with the outer structure of the boot to form a protective system allowing full and free movement of the foot, ankle, and leg. External entry has stretch accordion panel for a close fit and ease of entrance and removal. New, soft TPU stretch panel on the lateral side gives easy closure with an excellent fit. Zip is made from TPU to reduce friction in the event of a crash. Velcro tab locks the zip pull closed, keeping it flat and secure. Shin plate features new micro-adjustable ratchet top closure for safe and precise fit. On vented version: strategically positioned ventilation in heel and shin TPU guides air through the boot.